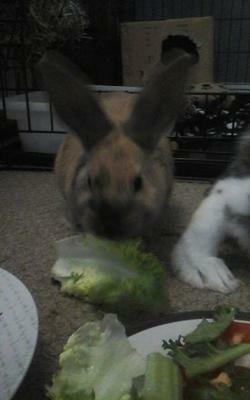 I have two rabbits, one of which is a mini lop and the other is unknown as I adopted her. Does anyone know her breed? That is not a lop rabbit. The ears are very large suggesting New Zealand or Standard Rex perhaps. The body size is smaller, but far too large for a dwarf. Definitely mix. Hi i believe your rabbit might be a dwarf lop that is quiet big i have had a similar rabbit to yours and mines is that breed and the same colour. Hopefully i could help.